A suspect arrested in connection with the abduction and death of a medical doctor working at the Omu-Aran General Hospital in Irepodun area of Kwara State, Dr. Tunde Abdulrahman, in July 2016 has explained that he personally shot the victim and later sold his corpse. Abdulrahman had been missing since he was abducted by three armed men who stormed his father’s house in Tanke area of Ilorin and took him away in his Toyota Corolla saloon car. Since his abduction, the kidnappers have not contacted the family to demand a ransom, creating apprehension that he might have been killed. But now, the police said he might have indeed been killed considering confessions made by the arrested suspect, Hammed Jamiu. Hammed is an ex-convict and the son of the long-time security guard at Abdulrahman’s family house in Oke-Ose area of Kwara State. The victim’s family were said to have reported the case to the Department of State Services who tracked his line to the home of the security guard, Mohammed Jamiu, Hammed’s father. Hammed reportedly fled to Sokoto State where he hid for four months only to return in November 2016. As he came back, the Inspector-General of Police Special intelligence Response Team apprehended him following a petition by the victim’s family to the police headquarters. IRT was said to have trailed Hammed to a hideout in Omu-Aran, Kwara State. He has since started helping the police in their investigation. According to Hammed, he shot Abdulrahman because the victim saw his face and was able to identify him. A police source said Hammed also took investigators to a forest in Kwara State, where he showed them some buried bones claiming that they were the remains of the doctor. Tests later revealed that they were that of a cow. Again, Hammed took the police to Ijebu-Ode in Ogun State, where a 24-year-old car snatcher, whom the police said had no link with the kidnapping was arrested. 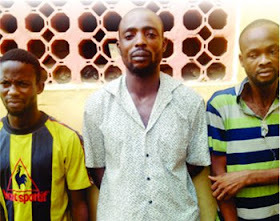 Hammed explained that he was lured into kidnapping by two friends – Dayo and Yemi – whom he met in prison. He said, “I started crime as a car snatcher and stole several cars from Kwara and Oyo states but I was arrested in 2015 and remanded in prison where I spent more than one year. “That was where I met my friends, Yemi and Dayo. When we were released and had nothing to do, Dayo suggested that we should go into kidnapping and I suggested we should kidnap the son of my father’s boss, who is a medical doctor. “They brought the guns we used in abduction. We took him out in his car and we drove him into a forest by Oke-Olowo and we had an argument and Abdulraman’s saw my face after I pulled off my mask. He called me by name. The police have said investigation was still ongoing on the case.